거대한 바위를 몸체 뒤의 광배(光背)로 삼고 자연 암반을 대좌(臺座)로 삼은 마애불인데, 매우 도드라지게 조각하여 부피감이 풍부하다. 3m가 넘는 이 불상은 현재 상태가 비교적 양호한 편이며, 도선국사가 하룻밤 사이에 만들었다는 전설이 전해지기도 한다. 민머리 위에 있는 상투 모양의 머리(육계)가 유난히 큼직하고 두 귀는 짧고 둥글다. 원만한 얼굴과 거기에 알맞게 묘사된 눈·코·입은 생기가 있으며 근엄한 편이다. 어깨가 넓고 가슴이 발달되어 있는데, 지나치게 볼록하여 다소 어색한 감은 들지만 팔과 다리에 입체감이 살아있어 생동감이 있다. 옷은 오른쪽 어깨를 드러내고 왼쪽 어깨에만 걸쳐 있으며, 옷주름은 평행의 선으로 간략하게 나타냈다. 두 손은 배에 놓고 있는데 왼손은 손바닥이 위로 향하였고 오른손은 손등을 보이면서 검지 손가락과 새끼 손가락을 펴고 있다. 구슬처럼 둥글게 표현한 머리광배에는 연꽃잎을 표현하였는데 이러한 구슬 모양의 머리광배는 그 예가 별로 없는 특이한 것으로 주목받는다. 양감이 풍부한 얼굴 표현 등은 통일신라 후기의 특징이지만, 풍만한 신체에 비하여 각 부분의 세부표현이 간략화된 점 등으로 보아 고려시대에 만들어진 불상으로 여겨진다. 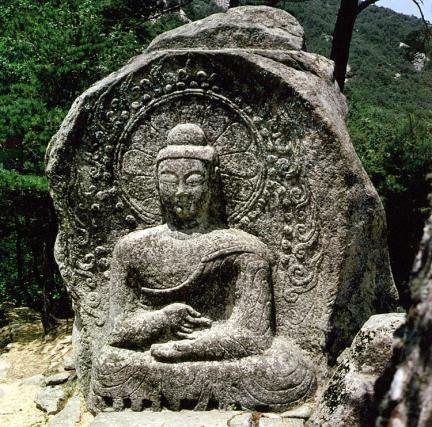 This rock-carved Buddha with a large mandorla carved from a large boulder is seated on a pedestal made of natural rock. Standing over 3m tall, the statue was carved in relief, with plenty of volume, and is preserved in a relatively good condition. 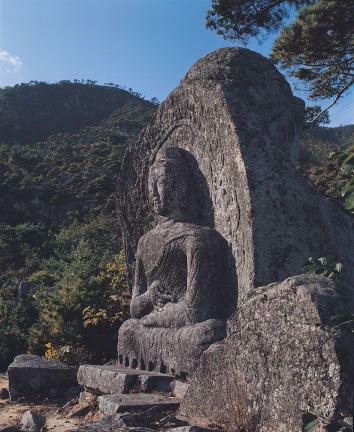 According to an ancient legend, State Preceptor Doseon sculpted the statue in a single day. The top of the head has a particularly large usnisa (a protuberance symbolizing supreme wisdom), while the ears are short and round. The Buddha’s face, with its vividly carved eyes, nose, and mouth, creates a solemn atmosphere. The body is stout, with broad shoulders and a well-developed chest, and the arms and legs look solid. The Buddha’s beobui (robe) hangs over his left shoulder, leaving the right shoulder exposed. The folds of his clothes are simply expressed in parallel lines. His two hands rest in his lap, but his left palm is turned upwards, while his right hand hangs down, with unfolded index and little fingers spreading out. 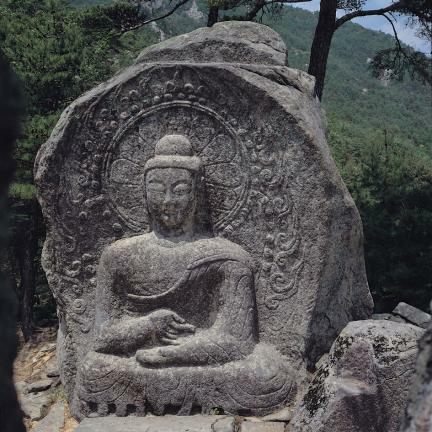 Unusually, the dugwang (light radiating from the head) behind the head is expressed in round bead patterns and carved with lotus petals.Although the Buddha’s voluptuous face is a characteristic feature of the late Unified Silla Period, the simply carved details compared to the voluminous body have led historians to presume that this statue was made during the Goryeo Dynasty.